This Basic Church Accounting eBook is for secretaries, treasurers and financial administrators who would like to more fully understand church accounting principles. I have read this informative book and it has definitely helped me to more understand the concepts of church accounting. What exactly goes on the balance sheet? How do you set up a chart of accounts for your church? Why do you credit cash in your accounting books when you write out a church check? What is the difference between single and double entry bookkeeping? How do you find and correct errors in your bookkeeping? This 34-page eBook answers these questions and much more. 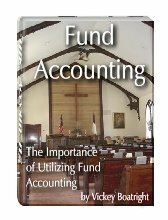 It will also help you to build a good solid foundation of understanding in church accounting. In addition, you will also receive this 12-page bonus report absolutely free as my special thank you for purchasing this book! The difference between fund accounting and commercial and personal accounting. Exactly what a ”Fund” is and what it is Not. What the difference is between unrestricted funds and temporarily and permanent restricted funds. The restrictions and details of transferring monies between two funds. 3 different methods to set up QuickBooks for fund accounting. If you want more information on these great Church Accounting products or if you want to purchase these products, click the link below. 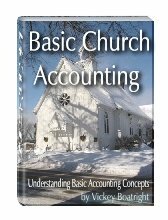 Click Here for the Basic Church Accounting eBooks. eCover graphics provided by www.kriswilliams.us. Return to Home Page from Accounting eBook.